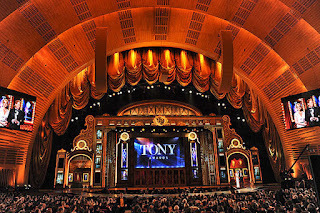 The live Tony Awards telecast from Radio City Music Hall. I always feel like that's the official kick-off to Gay Pride Month in early June. But that's just me. There was once a very strong chance you could not have seen that telecast. 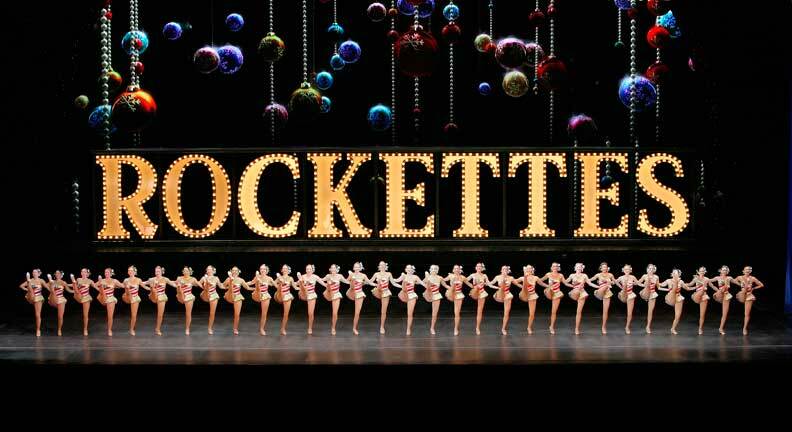 Or The Rockettes in the hugely popular Christmas Spectacular. Did you know that when he was 12 years old, actor Christian Slater played Tiny Tim in one of the Christmas shows? There was chance folks couldn't have seen that or anything else at Manhattan's gem of a location. 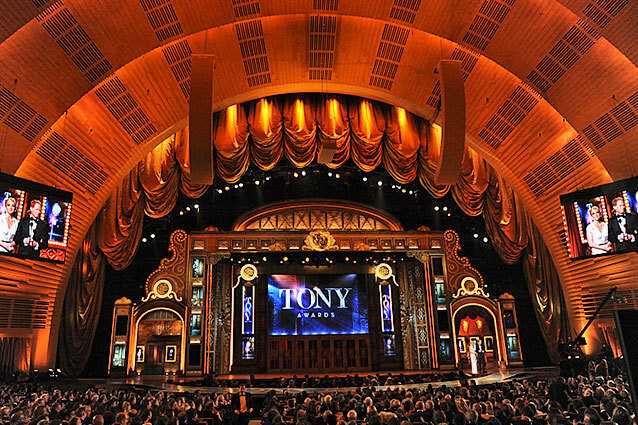 I watch The Tonys from Radio City Music Hall and think, "Wow...I know the woman who helped save that place from destruction." When I entered Radio City Music Hall one night in the 1980s for an exclusive movie event, I felt as if I'd died and gone to Art Deco heaven. It's gorgeous. I was there for the sold-out premiere of the newly-restored and remastered A Star Is Born, the 1954 classic film comeback of Judy Garland. We've seen the outside of this building in many movies. 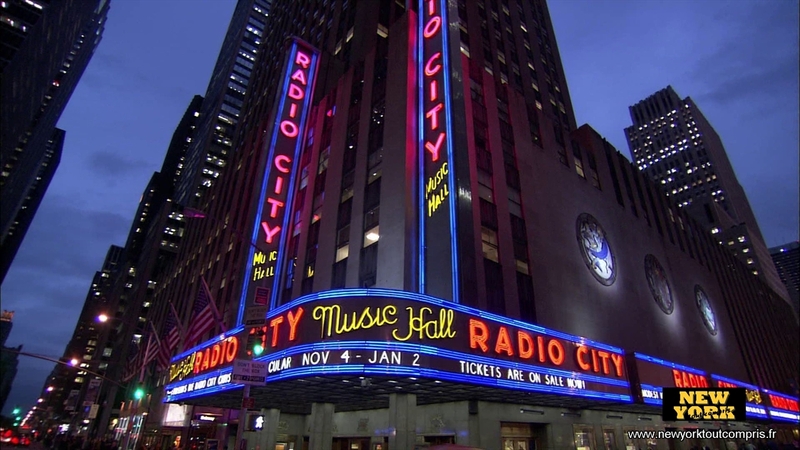 Radio City Music Hall is a cultural landmark and a major tourist attraction. It's called "The Showplace of the Nation." Inside is where millions of people have smiled at, applauded and cheered The Rockettes. On television, millions of people have watched Broadway's big night take place here. A ballet dancer was on her toes, in more ways than one, and charged into action to help save Radio City Music Hall. Her victory was one of art versus corporation. 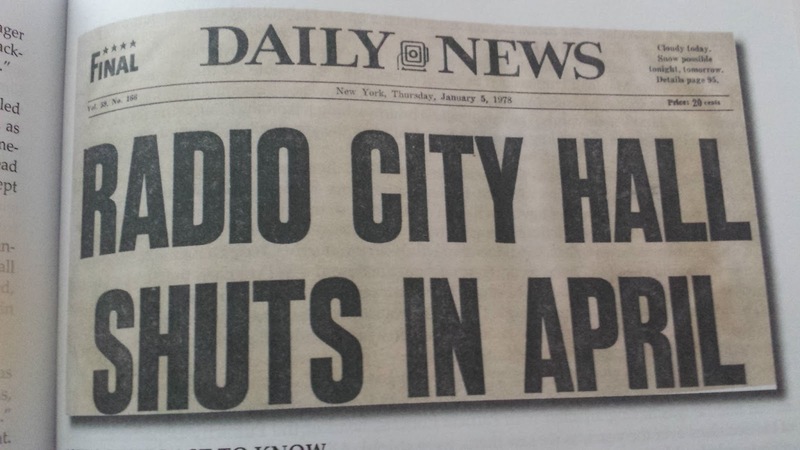 "When Rockefeller Center announced that Radio City Music Hall would be demolished, there was no immediate outcry. 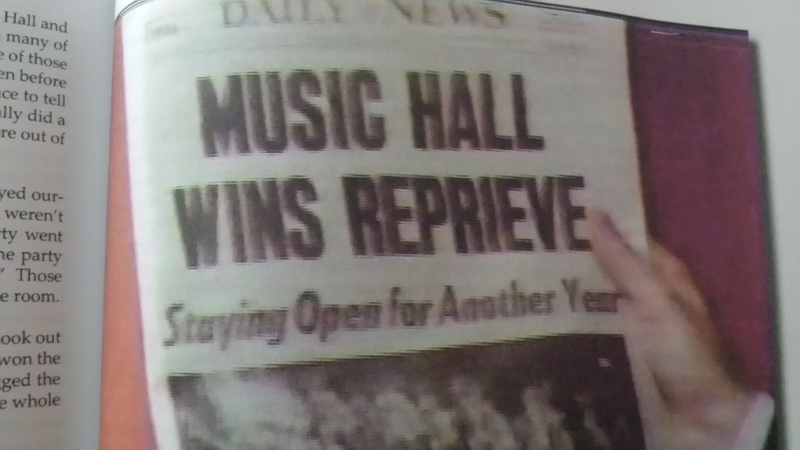 The major obstacle that could possibly get in the way of Rockefeller Center's plans to demolish the Music Hall would be its designation as a New York City landmark -- and nobody was pursuing it." "This is a 'David and Goliath' story in every way except one. Instead of rocks and a slingshot, we used words and deeds." 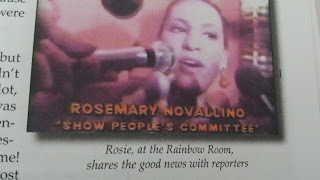 My fabulous friend, Rosie, started out as a dancer in the Radio City Music Hall Ballet Company. Over the course of her years and hard work there, she was promoted to being the company's Dance Captain. Here's a photo of her. 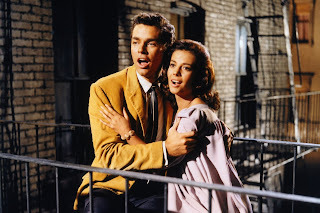 If you watch TCM (Turner Classic Movies) and appreciate classic films, you'll dig this: Rosie worked with choreographer Marc Platt. 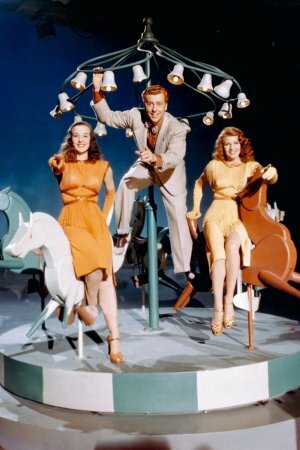 He was a featured dancer/actor in two of Rita Hayworth's best Technicolor musicals. 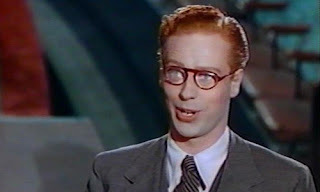 He was the dancer with the glasses in Tonight and Every Night, a 1945 backstage musical set in London during the war. He danced with Hayworth in 1947's Down to Earth, a musical comedy follow-up to 1941's afterlife fantasy romantic comedy hit, Here Comes Mr. Jordan. Hayworth (on the right in below pic) starred as the goddess Terpsichore. She begs Mr. Jordan to let her go to Earth and fix a Broadway musical currently in rehearsals. The goddess winds up becoming its star. Platt, on the far right in gray long underwear, was one of the backwoods brothers in the MGM classic musical. 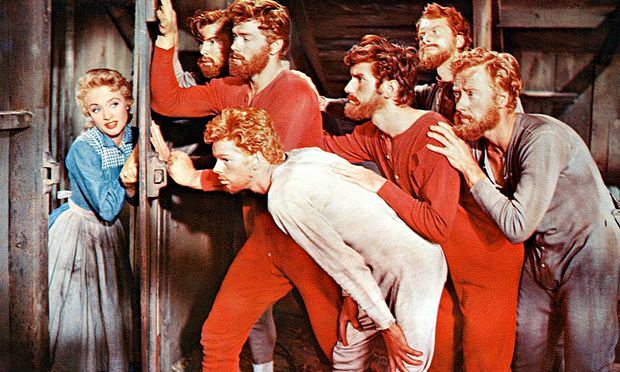 Seven Brides for Seven Brothers. 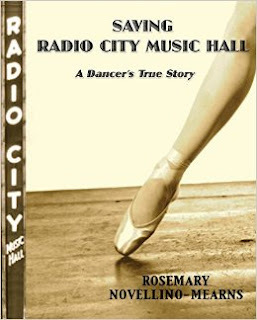 I'm not just writing this because Rosie is a dear friend, but because her publication has merit: SAVING RADIO CITY MUSIC HALL: A Dancer's True Story should be on the TCM website. 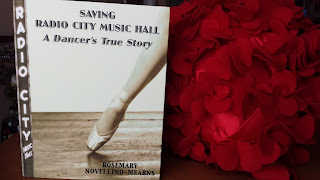 Besides the accounts of how she rallied folks to join her in the fight to save the landmark, there's also the story of her becoming a member of the ballet. She tells us about the grueling audition process and the rehearsals and the costuming and the personalities involved. It reminds you of A Chorus Line and the film, The Red Shoes. 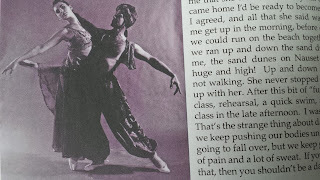 We read about movie stars and network figures in Rosie's story as she goes from auditions, like we saw in A Chorus Line, to being a company dancer on the front line in a battle to save a magnificent, one-of-a-kind artistic venue. Not only does she give you the details of the battle, she gives you fascinating technical facts about the Music Hall and a list of all the movies that played there. 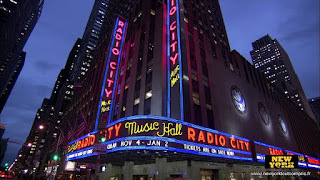 When I was kid in L.A., I dreamed of going to Radio City Music Hall. Not only had I seen it many times on TV, my mother talked about the thrill of seeing movies there. She grew up in New Jersey. From 1933's classic King Kong to Hitchcock's Notorious in the 1940s, from Singin' in the Rain, Auntie Mame, Funny Face plus Vincente Minnelli's The Bad and The Beautiful and The Band Wagon in the 1950s, to What's Up, Doc? starring Barbra Streisand, Robin and Marian starring Sean Connery and Audrey Hepburn and a reissue of Gone With The Wind in the 1970s...all the movies are listed. That's all in the book. So is a great love story -- about Bill, the terrific guy that Rosemary married. A woman who wore a tutu and toe shoes at work rallied friends, colleagues and media contacts like the late NBC talk show host, Tom Snyder, to rescue Radio City Music Hall. Rockefeller Center was the "Goliath." 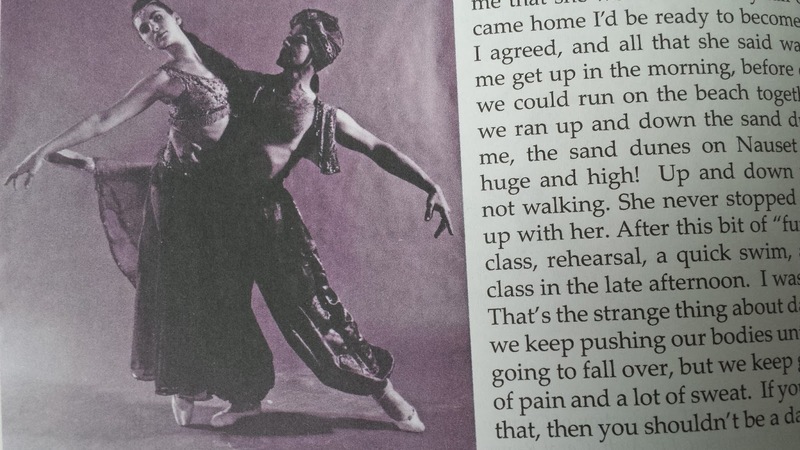 A Radio City Music Hall ballerina was a "David." There's book launch party coming up on June 11th. I'm so proud to know Rosie and I'm equally proud that she got her story on paper for us to read. She helped save a stellar piece of New York City history. Heck...this former ballet dancer should get a special Tony Award just for that! Rosemary Novellino-Mearns, dancer turned lyricist and author, is a Manhattan resident who makes Manhattan a brighter, more entertaining place to be. We can thank her by purchasing the book on either Amazon.com or on BarnesAndNoble.com. What a story. Only in New York. My memory of RCMH was in the 1970's. My mom took me and my sisters to see the Johnny Whitaker "Tom Sawyer". 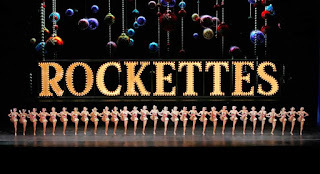 The Rocketts were like a dream sequence! The best part of the day was the kind ushers offered to mind our balloons in the box office. It's a memory I will never forget. Thank you for promoting the book. I will be looking forward to it! If You Want To Know What It Was Like To Save Radio City,This Is The Book! !There Are Many People Who Owe Rosie and Bill A Huge Thank You!! 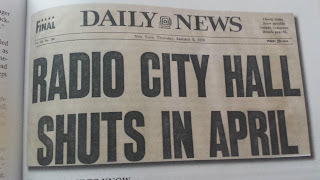 As A Member Of The Showpeoples Committee To Save Radio City I Can Tell You This Is How It Happened!! Thanks Again Rosie And Bill I SAm Proud To Call You My Feiend!!! The food at this venue was excellent, as was the service, many of our friends and family still rave about it. My wife and I highly recommend venues for events. We came here again for dinner and everything was again good and the service was extremely fast. Amen to that! It baffles me that Rosie is not a "household name," for the enormity of her achievement. The potential consequences that were at hand are almost unthinkable. Time marches on, other battles are fought...and millions file in-and-out of Radio City Music Hall, not knowing that they are able to do so, only due to the action and determination of Rosie Novellino-Mearns. BUY HER BOOK! It's amazing and unforgettable! New from Director of WHAT'S UP, DOC?